Since 2005, we have helped thousands of Canadians find survey panels they are eligible to join. No need to wade through lists of survey panels that are not available in Canada – we provide this service to you, completely free! It's easy! Take surveys from your computer, tablet, or smartphone by signing up with online surveys companies. Registration is totally free. Online survey companies are hired by corporations, non profit organizations and government agencies to conduct market research. 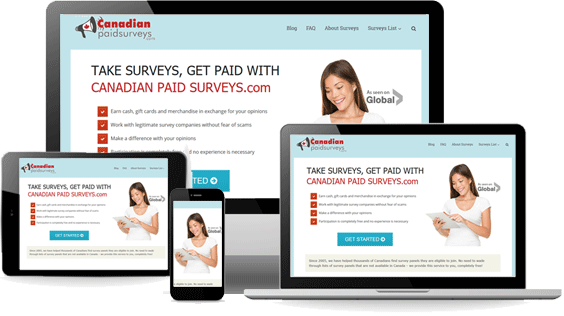 By joining survey sites, you become eligible to take surveys as they become available. 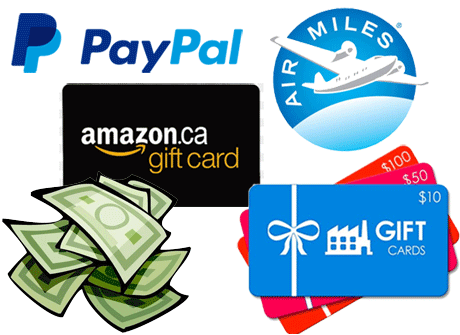 By participating in online surveys, you can earn your choice of cash paid by PayPal, gift certificates, Amazon e-vouchers, Air Miles Reward Miles, and more. You'll also have the opportunity to win various great prizes! All survey panels offer different rewards options - simply join the ones that offer the rewards you are interested in receiving. Who can take online surveys? Almost anyone! Whether you’re a teen, a stay-at-home mom or dad, a student, a senior citizen, are a doctor or are unemployed, you are eligible to participate in online surveys. No membership required and no scams to worry about. Simply join the survey panels YOU’RE interested in and start earning rewards right away!